When it comes to skating, we all position our feet in different locations. As positioning relates to longboarding, there are less variations between footing patterns. Longboards are more stable, travel in a straighter path, and require a little more effort to maneuver than skateboards. 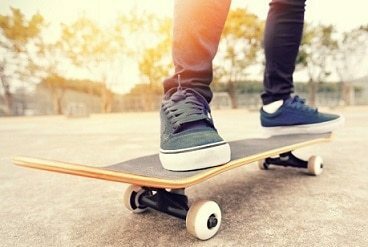 Since there are vast differences between skateboards and longboards, the same mindset should be applied to the necessary footwear requirements. There are plenty of crossover points between skateboard shoes and longboard shoes but applying the correct elements to your search can be a key factor in making the correct selection. Below we will introduce and review 8 different longboarding footwear selections. Following the review is an in-depth look at the focus points in your footwear, with detailed tips and pointers to help you make the correct selection. The first offering comes from our first mention in Adidas. Their Busenitz model is a thing of beauty and the properties that make-up this model will keep the user interested. This shoe operates via a leather and synthetic build, keeping a strong protection to the outer shell and introducing functionality at other areas of the build. The thick tongue is something that stands out with this model. This long extension affords the user the advantage over applied lockdown. They can string this area tight for a strong hold or leave it a little lose and still reap the benefits of a proper hold. The collar of the shoe utilizes the Geofit technology, which is a flexible design that accounts for the different foot sizes and types. The heel cup is also something to behold for the user. It uses pivot point technology which is a reinforcement that is noticed at the rear of the exterior. This is a double stack of cups that keeps the heel resting on a footbed of comfort. This bed also keeps the heel from experiencing any rotational pulling or twisting. This function carries to the ankle area, helping to reduce twists and pulls in this region as well. This shoe is designed in a mid-rise fashion, applying ample coverage to the major areas of the foot. The outsole is also thick and responsive. It includes pressure points and extensions at the main areas of the undercarriage. This helps the outsole map precise locations where pressures occur and combat them with comfort streams and cushions. This is a direct force to limiting fatigue and wear on the user. Getting a little more into the complexity of builds, the DC Heathrow model helps bring an athletic build to a space that is begging for a design change. Straying away from the common construction, this model introduces wraps, a grooved outsole, arch rise and supports, and a new style to deliver a higher stream of usage to the user. This model keeps the same textile build we are accustomed to, but it introduces a mesh upper for breathability increase and lightweight lockdown supports. The wrap occurs at the forefoot, being locked-in via the lacing of the shoes. This wraps to the outsole, emitting the proper amount of adjustable lockdown at the forefoot area. This forefoot support is often skipped out on by other production companies, but the importance remains high. The outsole is treated to the same vulcanized construction that we use for increased grip, but DC goes a step further by introducing cuts into the rubber. These grooves help account for position changes and adjustments, allowing us to be fully aware of our surroundings during travel. The second inclusion is the extensions. This treatment extends across the undercarriage, keeping a high amount of contact between shoe and board. This keeps the user stable and reduces slippage during travel. A wide heel counter is also introduced slightly above the heel at the rear of the shoe. This cut is widened to ensure proper shock support coverage. This notion keeps the user comfortable and supported during push-off. Extending for the upper-echelon of footwear production companies is Adidas. Their commitment to sound production means have kept them near the top of all footwear production companies, so it is no wonder they feature a presence in the skating industry with their Seeley Originals model. This low-profile shoe is made from synthetic and fabricated materials. This classic take on Adidas footwear features an abrasion resistant upper, that is treated with leather materials. This keeps the foot surrounded with an increase in safety measures, limiting the potential threat of injury to the user. A thin insertion point grips the foot, helping to fit almost any type or foot size. The tongue is also minimalized to lay flat across the top of the foot, applying enough space for you to apply pressures to the bottom of your feet for directional control once on-board. To counter for these pressures, Adidas included a thick, rubberized outsole. This outsole is made from vulcanized rubber, which is perfect for gripping the board to the proper hold. This rubber is slightly sticky, which makes for a solid adhesive for keeping you on the board. The thick nature of this area counters the pressures by absorbing the contact before it even reaches the bottom of your foot. This rubber component is also non-marking, allowing your board grip to remain consistent and fluent throughout consistent usage. Another top contender in the skating world is DC. They have been perfecting their craft for many years and it shows in their Anvil TX model. This low-cut option is made primarily from a textile build, with heavy stitching usage to keep the outer shell consistent and strong. Speaking to strength, most of the major components feature heavy stitching to help emit properties for the user's benefit. For example, the lace-up is separately stitched, helping to leave forefoot functioning for the side panels. The upper also features stitching around the insertion point, helping to create that little extra support and holding at the ankle/heel area. The stitching continues as we wrap our way around the shoe, with external stitching to display the interior effort for a solid heel cupping. This cupping is met by a counter to increase the comfort in this high traffic area. The outsole is designed using a vulcanized method, which is popular practice in the longboarding community. This helps the user emit natural traction in dual-partnership with the shoe, keeping stability and holding at a consistent increase. This thick outsole is also treated with abrasion resistant technology, reducing wear over time and increasing the overall protection for the user. This model features ample amounts of padding for a DC model, which is an inclusion that helps increase lockdown and comfort on the foot. This build also creates less slippage with a thick, flat base to use for support, push-off, and landing. One of the top players in the skate industry is Vans. Forever tied to skateboarding, this skating mecca has just announced their final installment of their Warped Tour concert series, but this finale doesn't have to spell the company from continued production. Their authentic canvas shoes are a model that meets many different interest levels. This low-cut design is built around the premise of keeping the outer shell flexible and the outsole thick and supportive. This allows for easier insertion and helps wide foot or flat foot users gain access to the proper fitting. The material is also stretchy and responsive, allowing the user to emit pressures at the sides of the shoe during turns and twists. The outer shell is a partner to board control, which is a positive feature for longboard users. The thick outsole stands out with the model. Elegant treatment keeps the color design and templates matching the shells. Whether it is functionality or look, this outsole does it all. Treated with the vulcanized method and other proprietary means, this undercarriage remains sticky and applies the correct number of adhesives. Vans designs their adhesives in a proprietary nature, helping to produce a substance the keeps your grip but does not damage the grain of the board by leaving behind sticky substance or the like. This outsole is also highly resistant to contact and abrasions, keeping the foot protected during travel. A simple design with the proper functions keeps this brand alive and strong in the skate boarding world. One of the other giants of production that tracks success back to the early development of the skate boarding sport is Etnies. Their conditional affection for the skate community has led to some brilliant production models, with the Jameson 2 being one of their most profound builds. This model is made from a canvas and synthetic combination, allowing the user that flex they need to apply the correct fit. The shoe also increases the support and reinforcement with stitching surrounding the main components of the shoe. A padded collar helps introduce the proper hold at the ankle area, reducing twists and applying the correct terms of lockdown. The true intrigue of this model comes at the midsole. Operating with midsole support is something that major production companies have left off of their builds. This EVA midsole design is soft for the user and it introduces support measures that can't be found in the outsole. This cushioning helps absorb blows to the foot, keeping the ride smooth and comfortable for the user. This midsole wraps completely around the shoe, heightening the coverage to the entire undercarriage portion. The outsole is also thick in nature, applying the correct foundation for stable movements and increased footing control. This helps to make turns and directional shifts a breeze. The undercarriage is also treated with vulcanized materials, keeping that strong grip on the board. It wouldn't be an athletic footwear discussion without the inclusion of Nike. The SB Zoom model specifically designed and tailored by Nike skate team member, Stefan Janoski is the perfect mix between comfort, function, and elegant design. We start with the design. The shoe is treated to a suede material that covers the outer shell. This template meshes perfectly with the classic swoosh logo, giving this model a refined look. The comfort is increased at the interior of the shoe. The included inserts operate using the Zoom cushioning system. This system closely emits the properties one would search for in a memory foam, adding a smooth notion to your ride. This support system also keeps the user for having to worry about stamina reduction or fatigue. It keeps the pressure off the feet, allowing a greater responsive movement during push-offs and landing. The upper also features a thick padding, which greets the foot at the tongue of the shoe and upon insertion. Not only does this material increase the comfort for the user, but it also applies a sense of lockdown to this low-cut model. The thick, rubberized outsole represents the flat and stable base the user desires during longboard travel. Its thickness properties increase the stability to ample levels, never keeping the user in limbo over slippage and footing concerns. These thickness properties also make for great shock absorbers, adding a second force to the pressure resistance phase of the shoe. This low-cut model fits like a low-profile shoe but has all the bells and whistles one would find in a mid-rise or high-top build. Osiris was a brand that garnished high amounts of attention during the late 90's and early 2000's, but the functionality of this footwear keeps the brand popular in the longboarding field today. The NYC 83 model is a high-top build that is comprised mainly of textile materials. This textile treatment extends to areas across the outer shell, with specific pockets of reinforcement or extensions to the build. This build allows the shoe to be highly abrasion resistant and able to withstand the test of time. Durability and functionality continue at the upper/insertion point of the shoe. A fully encompassing tongue wraps overtop that foot. Featuring extensive amounts of padding, this tongue not only provides lockdown support but introduces streams of comfort as well. Two side-by-side panels greet the ankle area, increasing stability and upright motions in this area. The back of the shoe introduces a stacking method to the heel counter. Layered materials meet a small, round counter that works to resist pressures and shocks from this high traffic area. This model also features a treated rubberized outsole that is perfect for gripping the grain of a board. This rubber is specifically treated for the adhesive advantage, helping you apply the necessary amounts of control on the board without having to emit excess pressure or stamina amounts. Save your stamina for the ride with the Osiris NYC 83 models. After scaling some of the options in the marketplace, there are a few areas of focus we would like to direct our attention to. 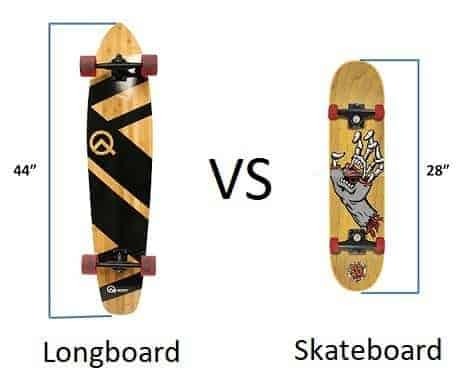 The first discussion point: what is the difference between skateboarding and longboarding shoes? Nothing. These shoes are termed as such to reach the correct genre of users. For example, you wouldn't want to buy skate shoes for basketball, nor would you want to buy basketball shoes for a game of tennis. The terminology sides with skateboarding because it has been around longer than longboarding. There are no major separators that keep a user from using a skateboarding shoe for longboarding, which is why our review is full of them. While longboarding shoes may be a genre of the future, for now, both co-exist within the same categories of footwear production. After clearing the air on the branding discussion, it is time to dive into the components of the shoe. One of the strongest elements that makes up a longboarding shoe is the outsole. You will often find these extensions ranging from an inch to 2 inches in thickness. This thickness increase is needed for stability and emitting the proper grip. Most of the outsoles with feature a flat undercarriage or a grooved pattern. The board is flat, so meeting force with force is the best way to combat the proper holding technique. Vulcanized materials are also common in the longboarding space. This keeps the proper grip on the board without leaving harmful residues that can eat away at the grain and grips of the board. Ensure your rubber type is treated properly, as too much sticky or adhesives will play a role in ruining your board. Some outsoles feature an arched design, which is often set aside for the athletic space. This build is fitting for those who have high arches or looking to correct flat feet. If the same treatment is exercised at the undercarriage for gripping, the front and rear of the shoe can provide enough traction for you to host success with these models. Flexibility is another key component because there are many executed directional changes in longboarding. The board is bigger and wider, calling for the user to emit more force and pressures if they are looking to change directions or shift their bodies. The outer shell is what keeps the foot safe from abrasions and safe from the elements. If it is stiff, it doesn't allow the user for these quick changes, which may ultimately lead to accident or problems. Allowing the user to shift their feet within the shoe or giving the material flex to combat these shifts will allow for the proper production of pressures. If you limit this movement, you limit the control the user has over their board. A responsive shoe is one that is made from mesh, canvas, or textile materials. These material types can feature reinforcement, but they also allow for the proper amount of flex in build, keeping the user headed in the correct direction. After taking these different models into consideration, there are a few we would like to draw specific attention to. When it comes to the Editor's selection, the Adidas Busenitz sneaker took the cake. Throwing price out the window, the construction of this model represents the perfect fit for longboard users. It is a mid-rise construction, which adds the element of ankle protection to an already solid leather build. The adjustable tongue helps keep the lockdown of the forefoot high and keeps the user's comfort in-mind as well. The outsole is thick but doesn't add as much weight to the bottom of the foot, which is important for footing changes. This outsole is also more conducive to hitting the main pressure points of the foot, making this model the perfect companion for long riding sessions. The value play of the litter is the DC Heathrow model. The price point of this model is on-point with the other low-end options extending from this space, leaving the properties to benefit. The design closely mimics an athletic build, which is important for comfort and stability increases. The wrap around the forefoot adds lockdown and holding to an area that is often forgotten in the longboarding shoe space. The outsole is responsive to your movement and shifts. This area is also lightweight, allowing you to make those quick directional changes. Finally, this shoe fits like a mid-rise option, keeping the ankle fully protected. As with all of our selections, the decision remains in the hands of the user. If you are looking for a long ride companion, keep the overall construction light and utilize a practical outsole. If you are looking for something to provide the necessary support, no matter the ride, opt for that solid foundation in the thick outsole. It with produce the base you need to meet the flat surface of the board. Also note that construction models will look similar, so exercise your increased knowledge of the interior and exterior of the shoe. Asking questions about the midsole, sock liner, inserts, heel cup, heel counter, and other such talking points can make the difference between one selection and a better one.